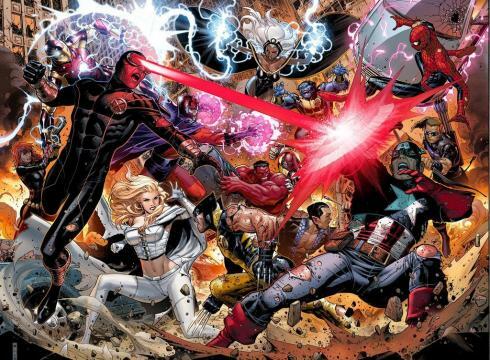 The Avengers will fight with the X-Men starting in April. Photo property of Marvel Comics. 2012 might be called “The Year of Marvel” at the end of December 2012. This purpose of jacobelyacharjournalist.com’s blog entry is to highlight the key elements that could make Marvel dominant over DC. After seeing Captain America, Iron Man, Thor and the Hulk in their separate movies, all four heroes will be together on the silver screen for the first time. Joining them in this film are Nick Fury, Hawkeye and Black Widow while Loki will menace the group. Fanboys and fangirls everywhere will congregate to movie theatres everywhere to watch the action unfold. The film stars Chris Evans, Robert Downey, Jr., Chris Hemsworth, Mark Ruffalo, Samuel L. Jackson, Scarlet Johansson and more while famed Buffy the Vampire Slayer creator Joss Whedon directs the film. The Amazing Spider-Man will hit movie theatres everywhere on July 3, 2012. This will be the first film for the franchise since 2007’s Spider-Man 3. In the reboot, British actor Andrew Garfield will tackle the role of Spider-Man/Peter Parker as he struggles to win the heart of Gwen Stacy (Emma Stone) while facing the nightmarish Lizard (played by Rhys Ifans). Martin Sheen, Sally Field and Denis Leary round out the cast as they portray Uncle Ben, Aunt May and Captain George Stacy respectively. Exhibit #3: Ultimate Spider-Man airs on T.V. Not only will Spider-Man be swinging onto the Silver Screen but the famed Wall Crawler will also be hitting the T.V. screens as Ultimate Spider-Man will hit Disney XD airwaves during Fall 2012. The series follows Spidey (voiced by Drake Bell) as he tries to balance normal life as Peter Parker while facing the everyday chaos being a superhero in the Marvel Universe. Popular comic writers Brian Michael Bendis, Paul Dini and Joe Kelly are among the animated series writing staff while J.K. Simmons and Clark Gregg will voice their respective movie characters J. Jonah Jameson and S.H.I.E.L.D. Agent Phil Coulson in the series. Fans were shocked to see Johnny Storm return after his apparent death in the renumbered Fantastic Four #600. After his resurrection, many fans continue to savor what writer Jonathan Hickman has planned for the two Fantastic Four titles: Fantastic Four and FF. Readers can pick up these issues at their local comic shops. This will be one extremely busy year for Spider-Man. In the spring, Spider-Man will tackle his arch foe: Doctor Octopus from taking over the world. Readers have seen Doc Ock tackle other heroes like Iron Man and the Avengers Academy as he preps for his potential final battle with his arch foe. The six-part story arc is written by Amazing Spider-Man scribe Dan Slott and features artwork from Stefano Caselli. The biggest storyline that Marvel fans will be talking about is Avengers v. X-Men. The 12 bi-weekly issues will feature the legendary superhero teams clashing with each other. In an USATODAY.com story, the fight might break out because of the return of The Phoenix Force. The story will feature writing from Brian Michael Bendis, Jonathan Hickman, Ed Brubaker, Jason Aaron and Matt Fraction while Marvel artists John Romita, Jr., Adam Kubert and Oliver Coipel are on art duty.